It was unlike any abandoned place I'd ever explored. Despite being completely deserted and open, everything was clean and in its place. Nothing was trashed or overgrown and graffiti wasn't sprayed across the crisp wood walls. But, something didn't feel right. A heavy foreboding hung in the warm air. It was like gazing at a historic battlefield. The wildflowers and green rolling hills are lovely, but at one time, it cradled the blood and bones of hundreds. The rain is sporadic and the humid air cooled by soft breeze on Koh Chang. 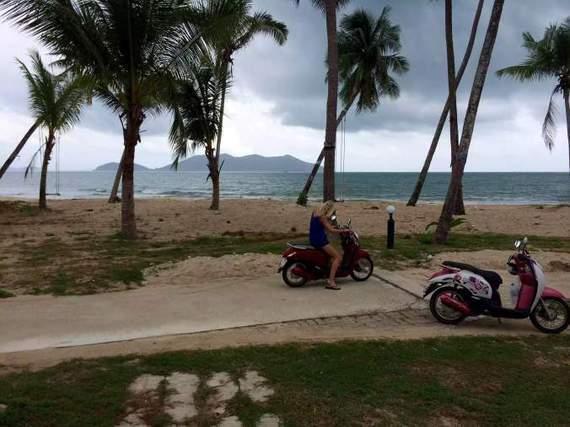 My best friend Desiree and I had been staying on Lonely beach for a couple of days and quickly became rooted to life on this quiet island in the Gulf of Thailand. It's one of those places that feeds your sins in a way that renders not an ounce of guilt or regret. An island of secrets and hushed whispers, this is a tropical paradise where the moon is worshiped with howls; where the poi dancers aren't local entertainers, but sorcerers of orange heat and blue magic, scorched skin and ember eyes. They watch like a predator watches its prey; arrogant grins as they paint the night sky with swirling flames. 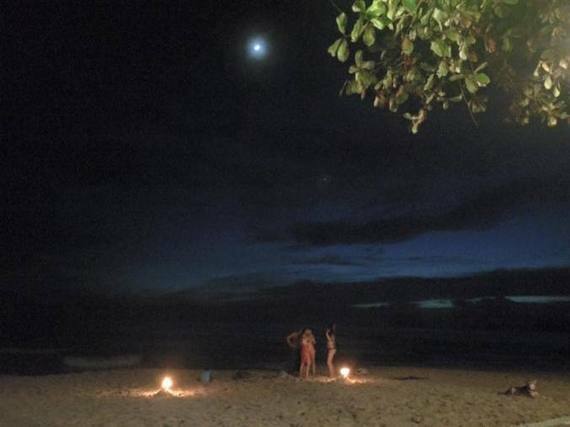 On Koh Chang, you dance with the devil late into the night and never leave. Des and I had stumbled upon a bizarre discovery while exploring the island on scooters one day. A dirt road had brought us to a deserted beach and bay. It was a picture out of a luxury travel magazine, complete with a wide stretch of crunchy pink sand and mop-topped palms. A small inlet had been cut out of the bay to make an aquatic parking space. It's inhabitant was a monstrous floating cruise ship. We pulled over and stared at the curious thing for awhile. We had stumbled upon a flying saucer of the sea, crash landed upon the island of Koh Chang. 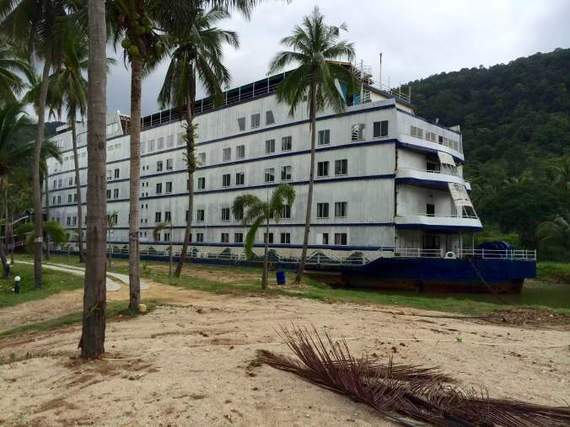 It looked as if the abandoned ship had been turned into a floating hotel of horrors. The afternoon storm clouds rolled in, bringing out the black slime that blanketed its drab white walls like leprosy. The towering body was pock-marked with dozens of dark cabin room windows. I rested my eyes upon each pane, half expecting a ghostly face to stare at us from one of them. But no one else was here on this beach. This pristine beach scarred by this spooky vessel. Only the lonely palms swayed like dancing slaves around its dominating figure as the wind began to pick up. Inside, the quiet stillness was not expected and the air smelled of old wood. An unfamiliar electricity clung to the hairs of our bodies. The decor was dated yet modest, dusty yet protected from the harsh tropical weather due to the ship's dense exterior. A reception desk greeted us and long narrow hallways ran down either side. 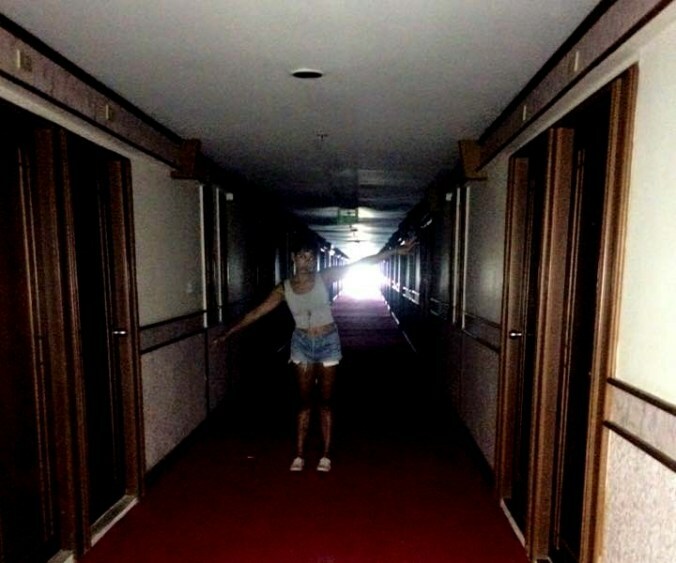 The corridors were dark save for a milky bright light at the end of each outstretched hall; cabin doors casting shadows in the eerie interbreeding of light and dark. We ascended the staircase to a higher deck with cat-like steps, pretending to be invisible to whoever was watching from the shadows. We stepped into one of the hallways that tunneled the length of the room like a stretched spine, and the unearthly feeling intensified. I shook the brass knob of one locked door after another, daring one to open, and said suddenly, "Let's go back downstairs." Below the initial reception area we had entered through, there was a room. It was dirty and the bowels of the ship had been breached by the air here. Windows were salt slicked and a depressed moan seemed to echo as the wind shook its bones and black waves stung its hull. We decided it was time to leave. As we headed towards our escape, what stood out in magnificent splendor was the most divine Spirit House I had ever seen. Spirit Houses are found throughout Southeast Asia. In Thailand, you will see them perched outside any and every establishment, from the most prominent skyscraper in Bangkok to the small village or the forests and mountains. These ornate structures resembling houses or temples represent the ancient spirit worship and rituals that have survived for centuries. 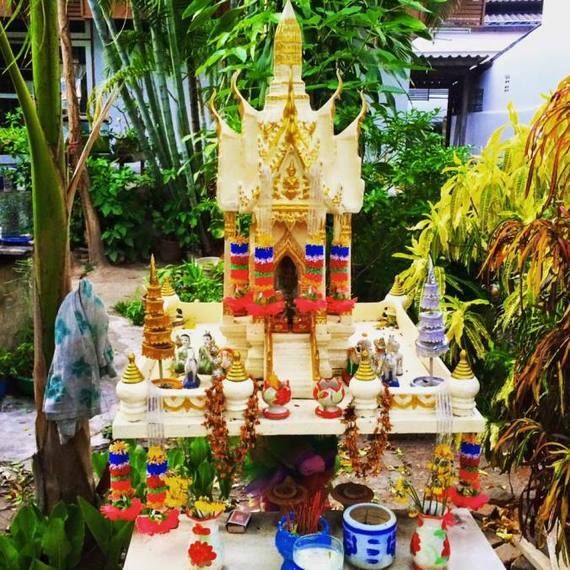 The purpose of a Spirit House it to provide shelter and appease spirits that have remained on the earth, in a particular place. A Brahm priest skilled in astrology, chanting and Hindu rituals is the master of this age old tradition. They also communicate with the spirits. The Brahm priest uses his wisdom to choose the proper location, cardinal position, height, and color of a spirit house. The overall construction and the offerings of various foods, drinks, statues and the burning of incense reflect the whims of the spirit that has been invited to stay. This particular Spirit House stood boldly on a sturdy dias, placed in its own quiet nook of the ship. Shimmering with brilliant mosaic glass pieces and slick gold paint, the grand palace glowed; picking up any trace of sunlight and reflecting the intricate details of the palace roof and windows.It was a valiant shield lifted against the discomfort of this bizarre ship. There were neat glasses of water with straws and plates of sweet smelling blossoms and snacks. Not a speck of dust was found on the spirit house, in fact, it looked as if it was the one object in this place that radiated life and color. When we arrived back at Lonely Beach, Desiree and I couldn't stop thinking about that creepy ship. The few locals we asked seemed reluctant to speak about it. As Des Googled furiously on her phone, I asked the Thai woman whom we had rented the scooters some questions. Why was such a beautiful beach so desolate, why the ship? She didn't smile and there was a slight trace of fear in her voice. "People have died there. Someone jumped from the roof and the hotel closed," she murmured, as her eyes darted and she busied her hands. "It only opens during high season if every other hotel on the island is full." *Note: We were told that there had been deaths, but I couldn't find any sources to back up the claim. Regardless, this place is scary and weird. If you enjoy exploring abandoned places- the ghost ship and its beautiful hidden beach will captivate you.